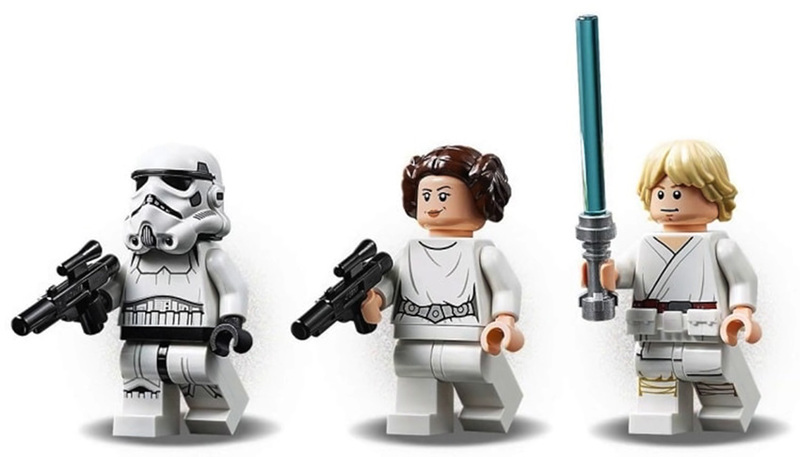 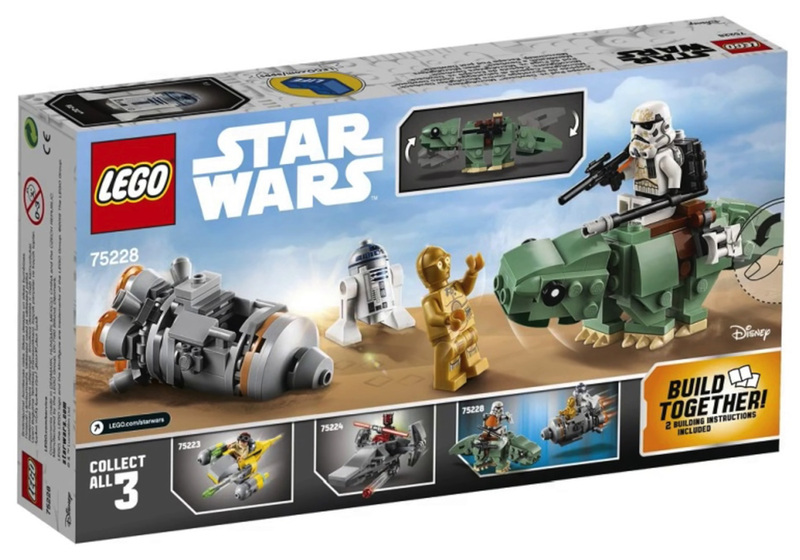 It’s a new year which can mean only one thing — new LEGO Star Wars sets are available now…. 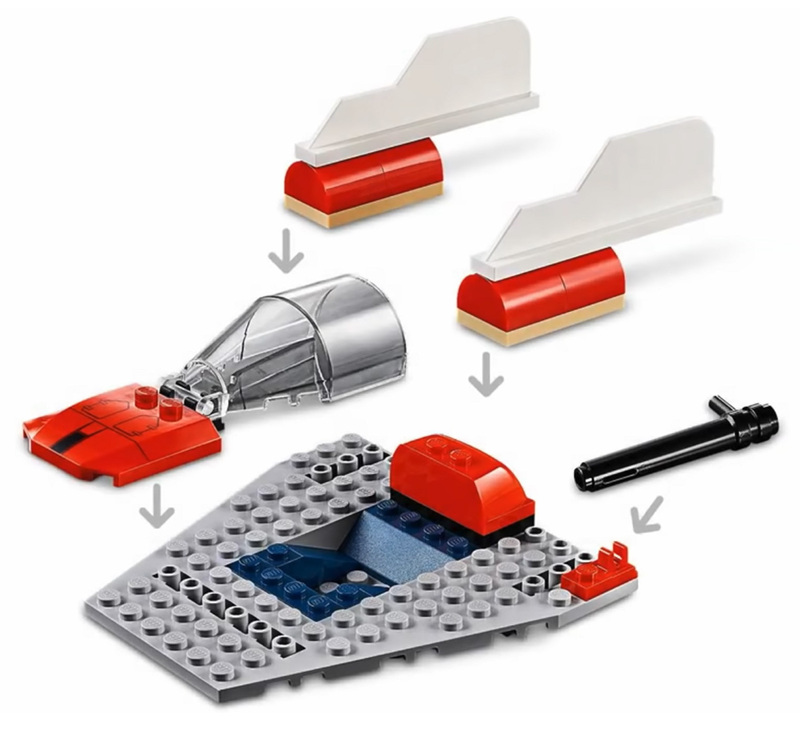 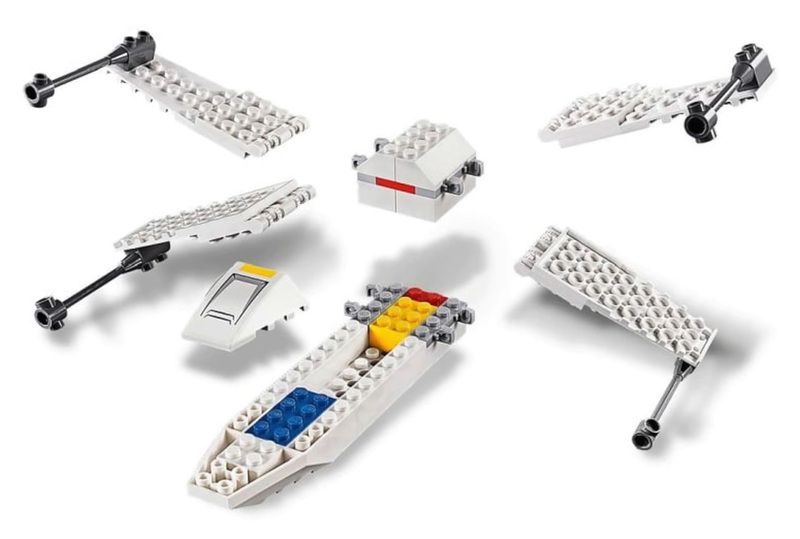 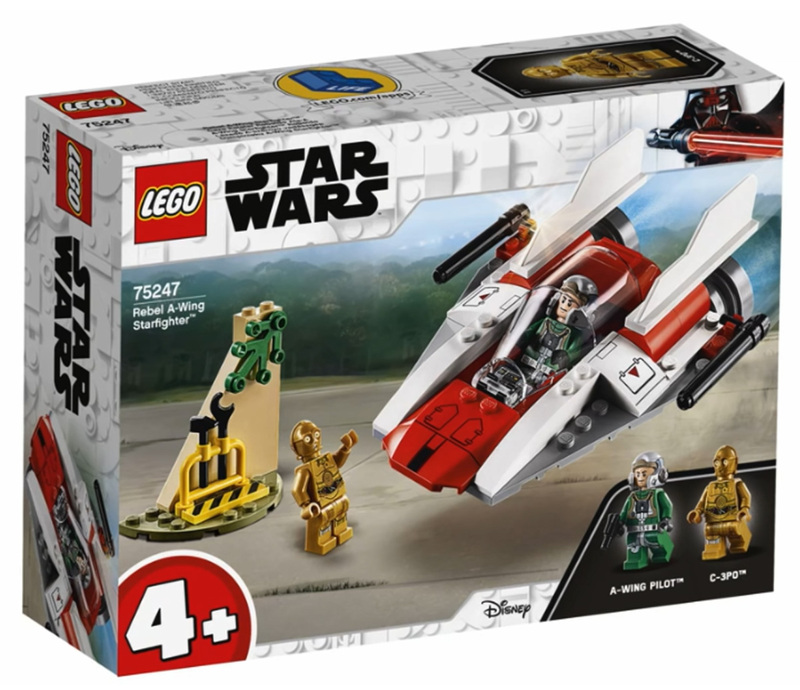 LEGO Star Wars 4+ Range — ‘Juniors’ like sets; easy to build with all printed parts. 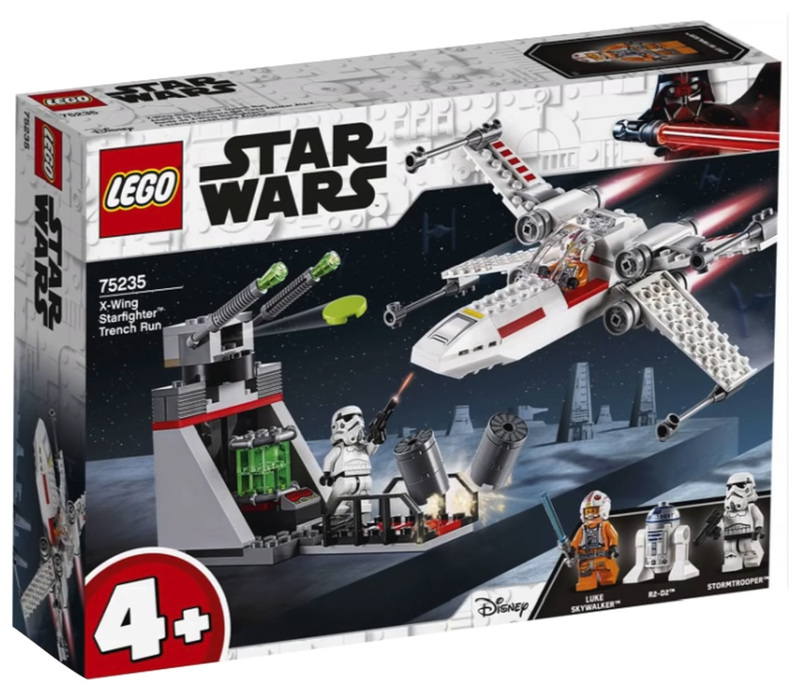 X-Wing Starfighter Trench Run (#75235) — X-Wing Starfighter, Turret with firing disc shooters and two minifigures of Luke Skywalker in his X-Wing Pilot Suit, Stromtrooper (new helmet design) and R2-D2; 132 pieces for $29.99. 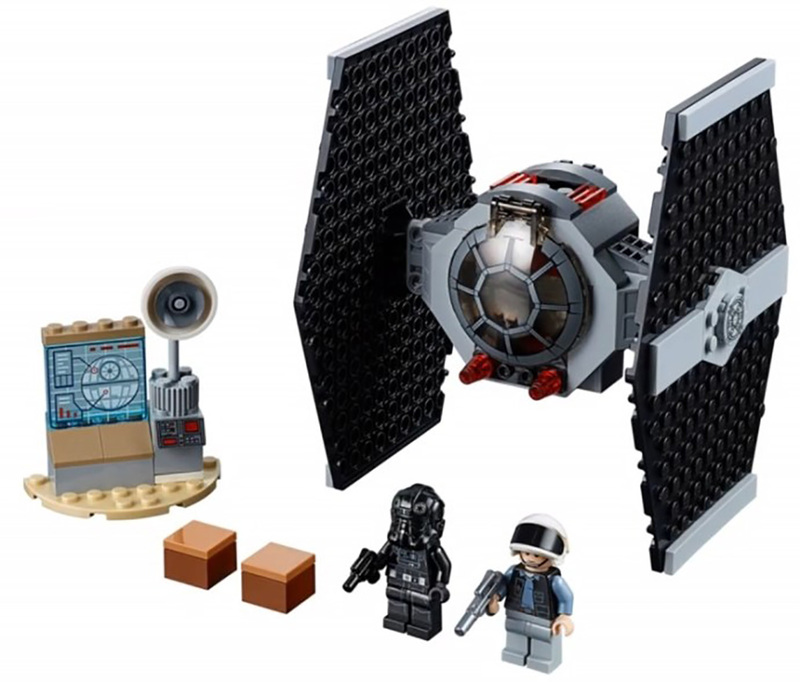 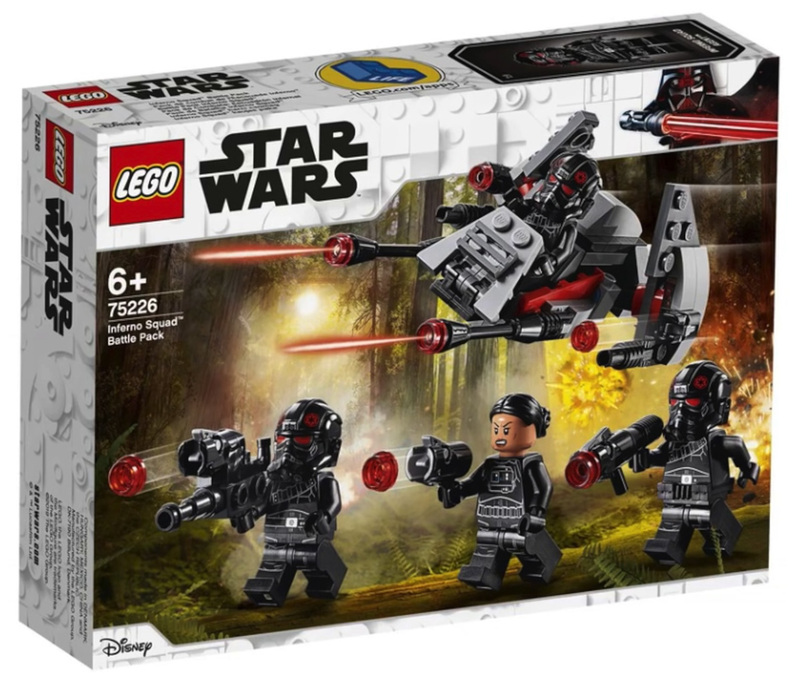 TIE Fighter Attack (#75237) — TIE Fighter with two minifigures, TIE Fighter Pilot and Rebel Fleet Trooper; 77 pieces for $19.99. 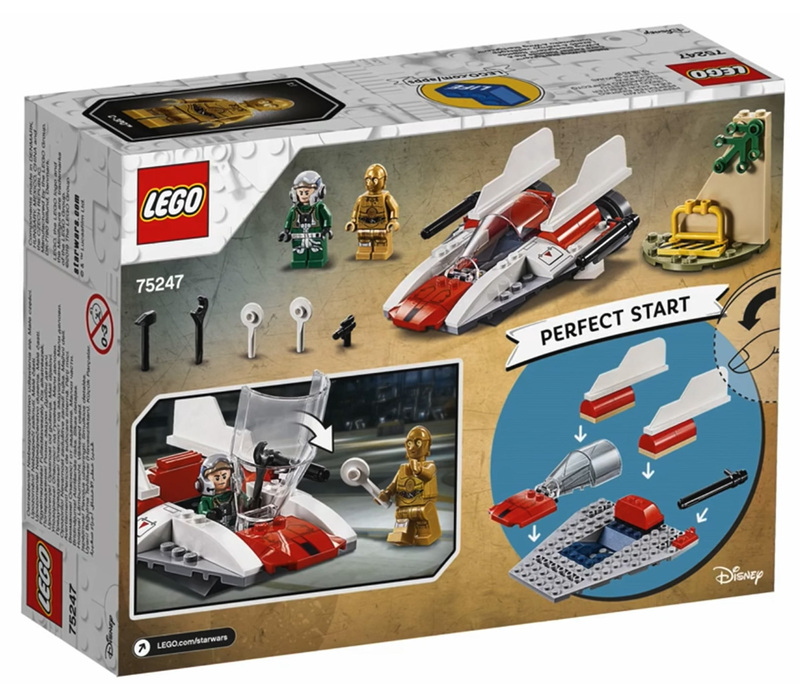 Rebel A-Wing Starfighter (#75247) — A-Wing Starfighter with two minifigures, A-Wing Pilot and C-3PO; 62 pieces for $19.99. 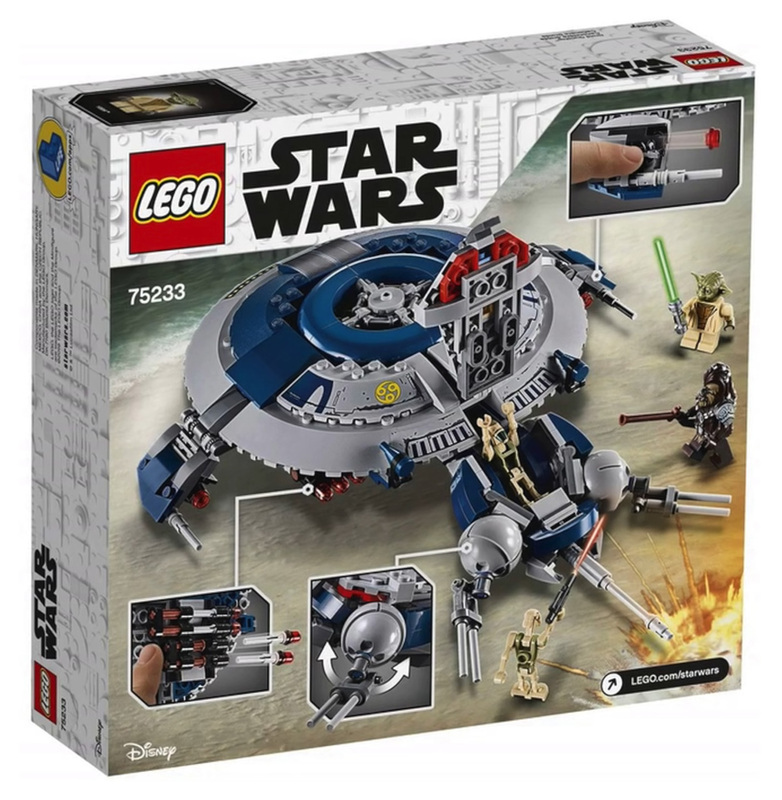 Naboo Starfighter Microfighter (#75223) — Naboo Starfighter with Young Anakin minifigure and R2-D2 dome; $9.99. 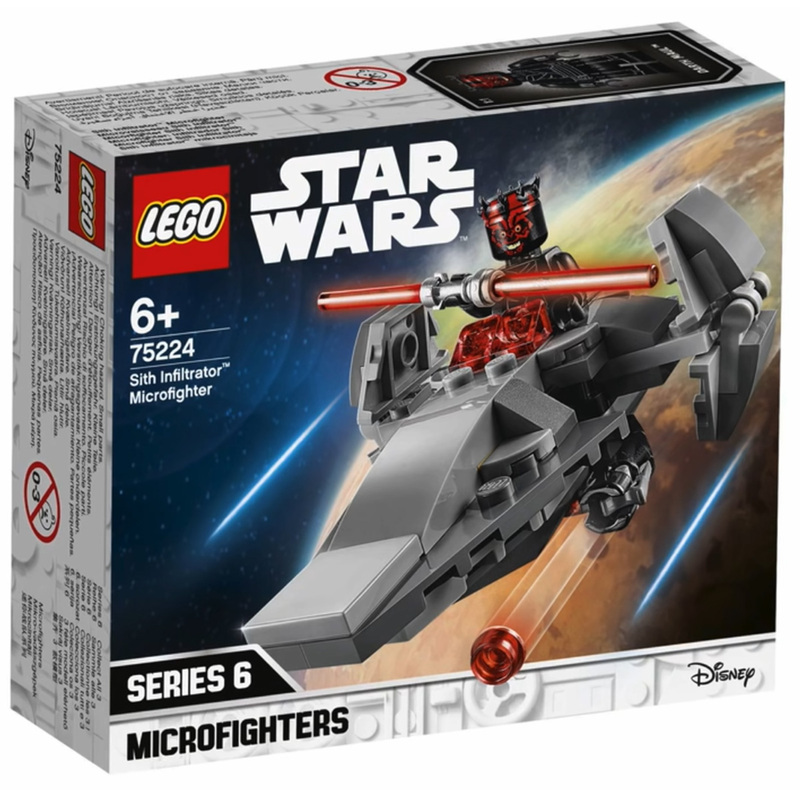 Sith Infiltrator Microfighter (#75224) — Sith Infiltrator with Darth Maul; 92 pieces for $9.99. 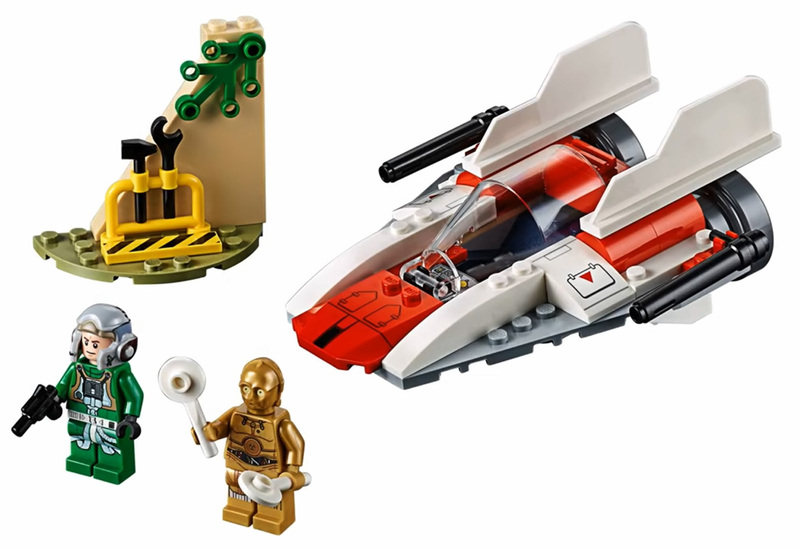 Escape Pod vs. Dewback Microfighters (#75228) — Escape Pod, Dewback and two minifigures, Sandtrooper (new helmet design), C-3PO and R2-D2; 176 pieces for $19.99. 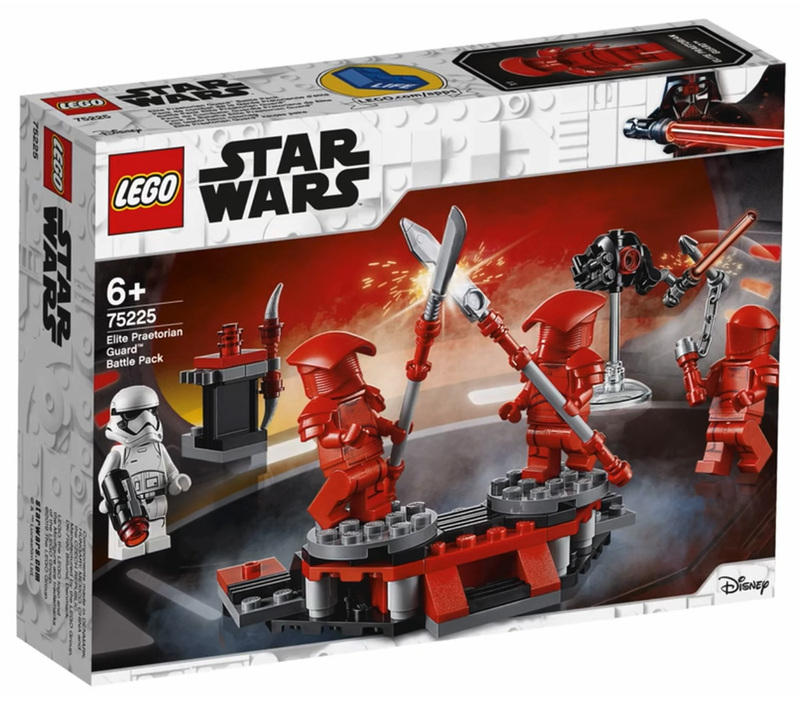 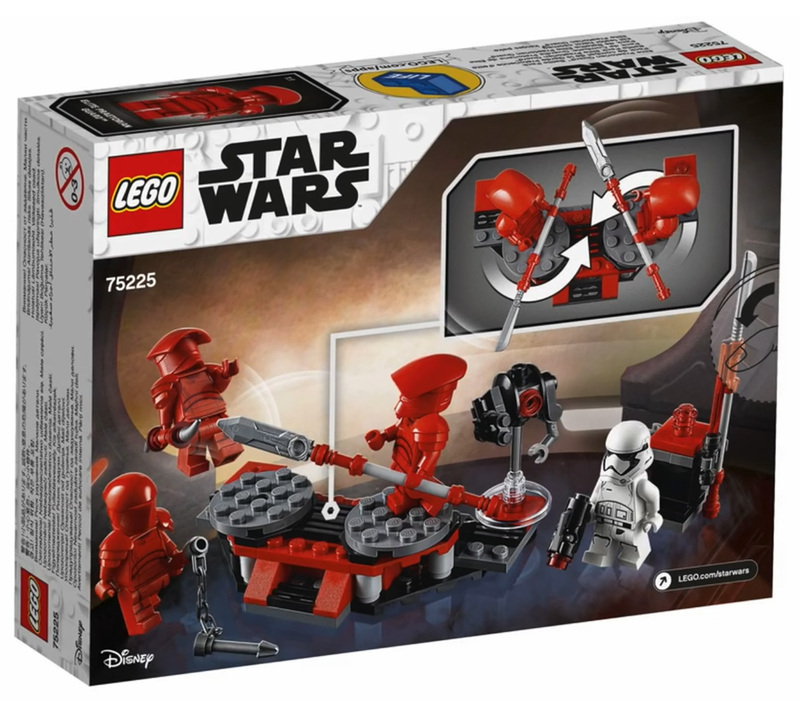 Elite Praetorian Guard Battle Pack (#75225) — includes one First Order Stormtrooper and three Praetorian Guards (two different helmets), spinning battle platform and training droid; 109 pieces for $14.99. 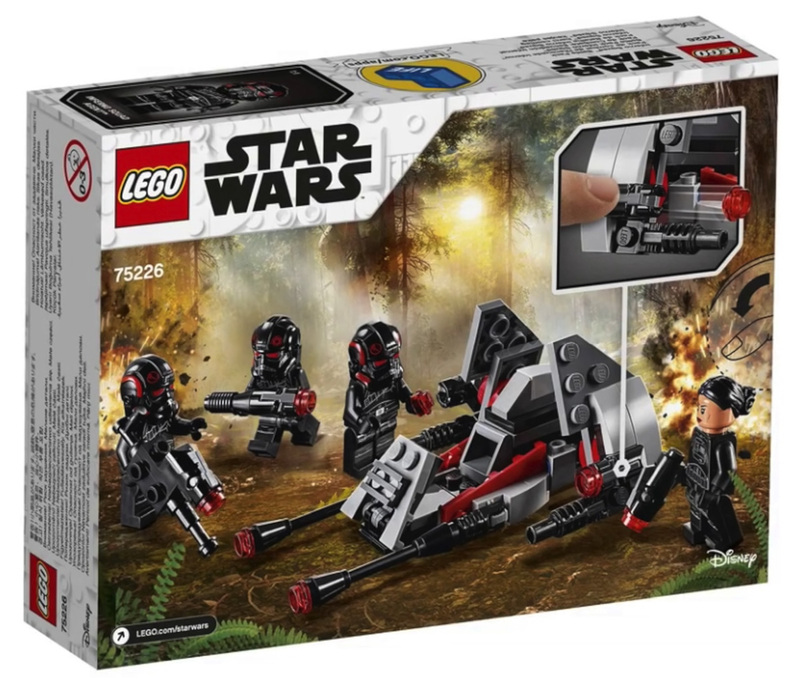 Inferno Squad Battle Pack (#75226) — includes four Imperial commandos that form Inferno Squad in Battlefront II video game and novel; 118 pieces for $14.99. 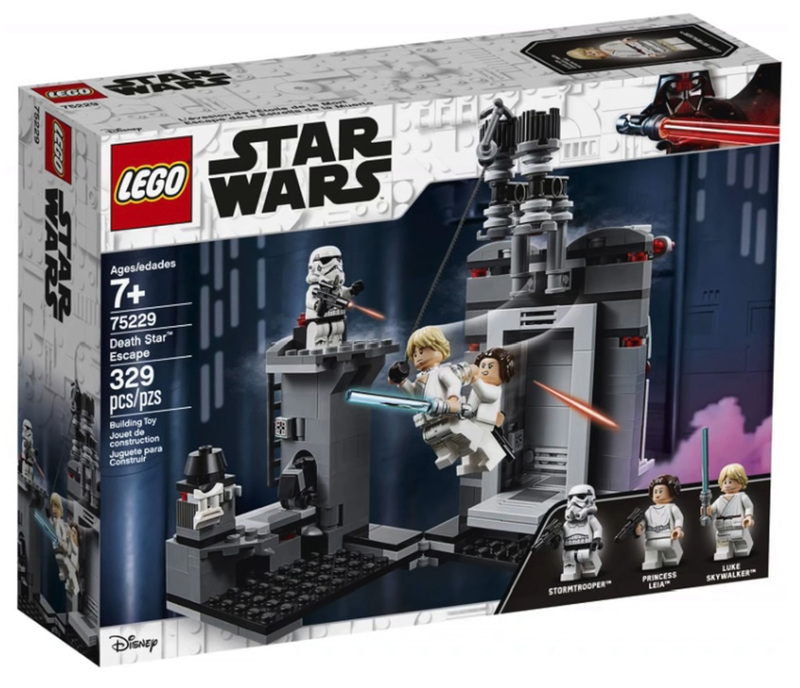 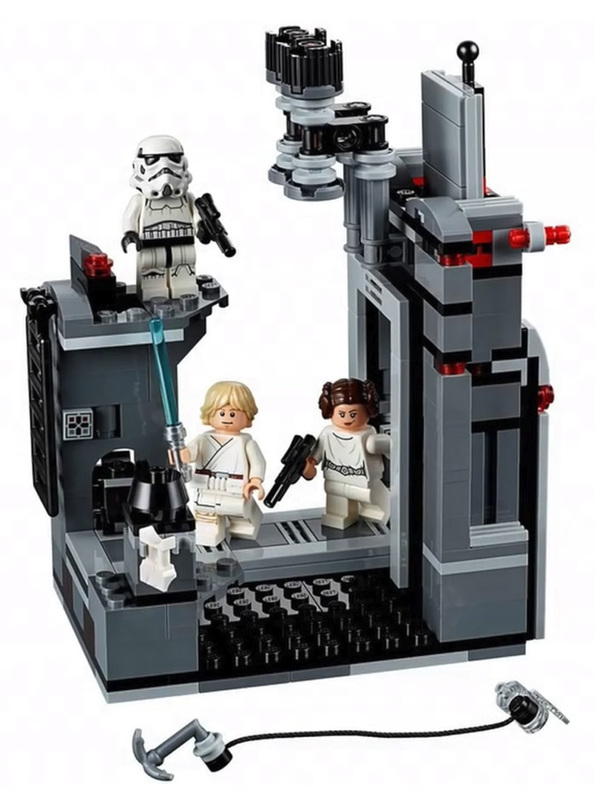 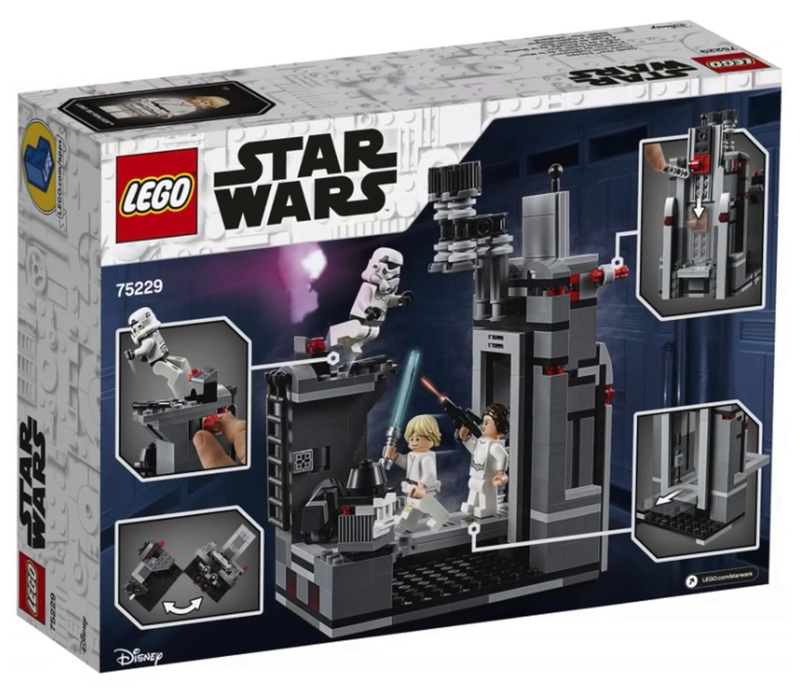 Death Star Escape (#75229) — includes Death Star section with fold out play-set allowing you to recreate the escape from Star Wars: A New Hope, comes with three minifigures of Luke Skywalker, Princess Leia, Stormtrooper (with new helmet) and brick built Death Star Droid. 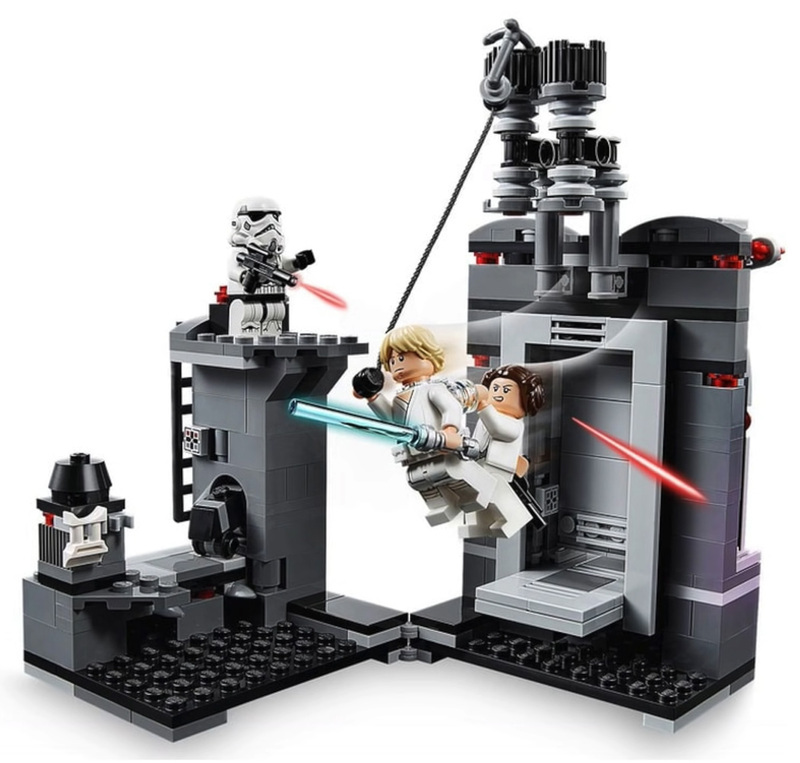 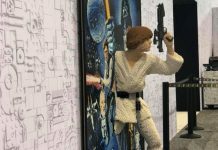 Leia is able to join onto Luke’s back to swing the chasm. 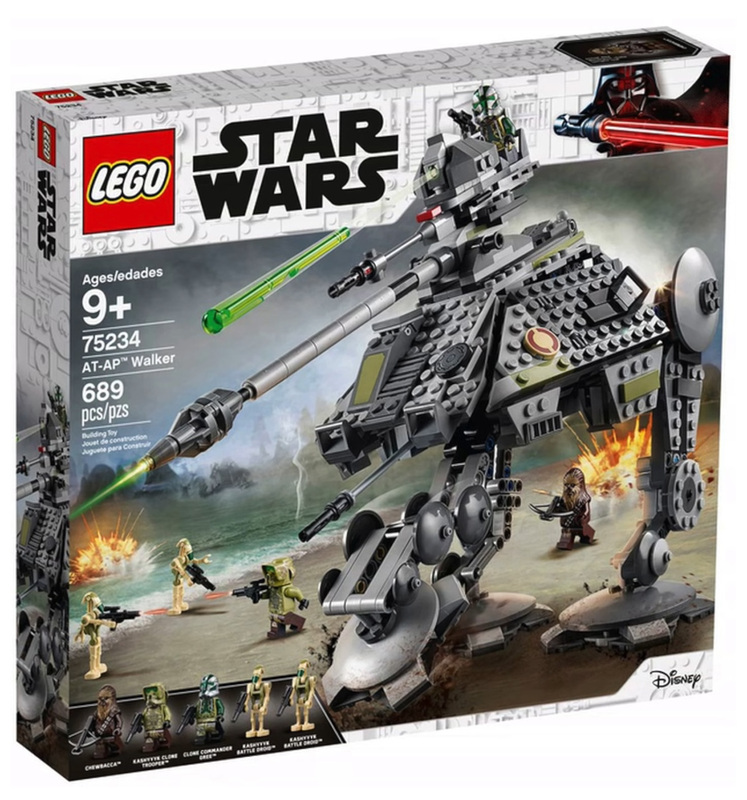 329 pieces. 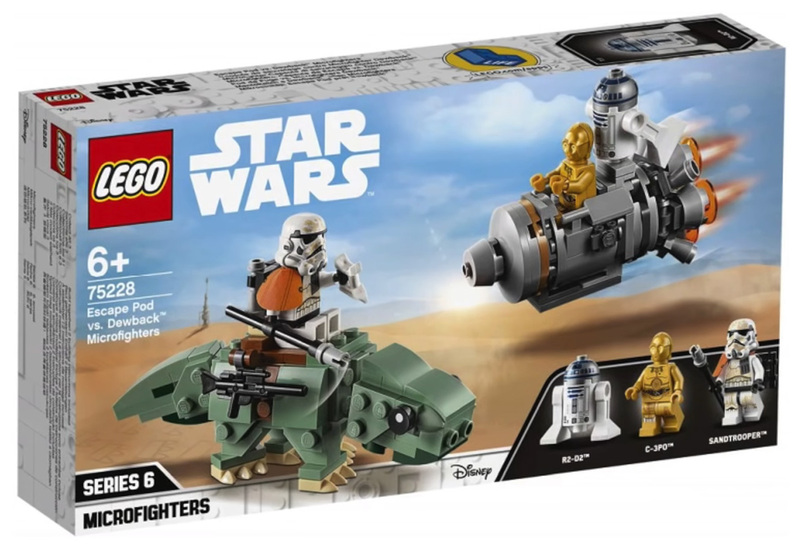 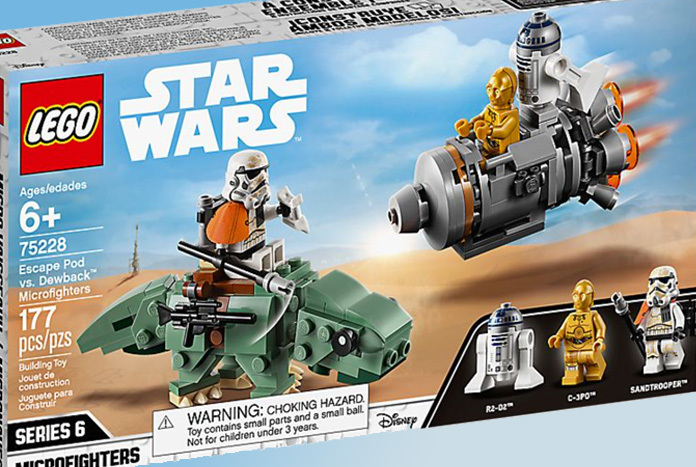 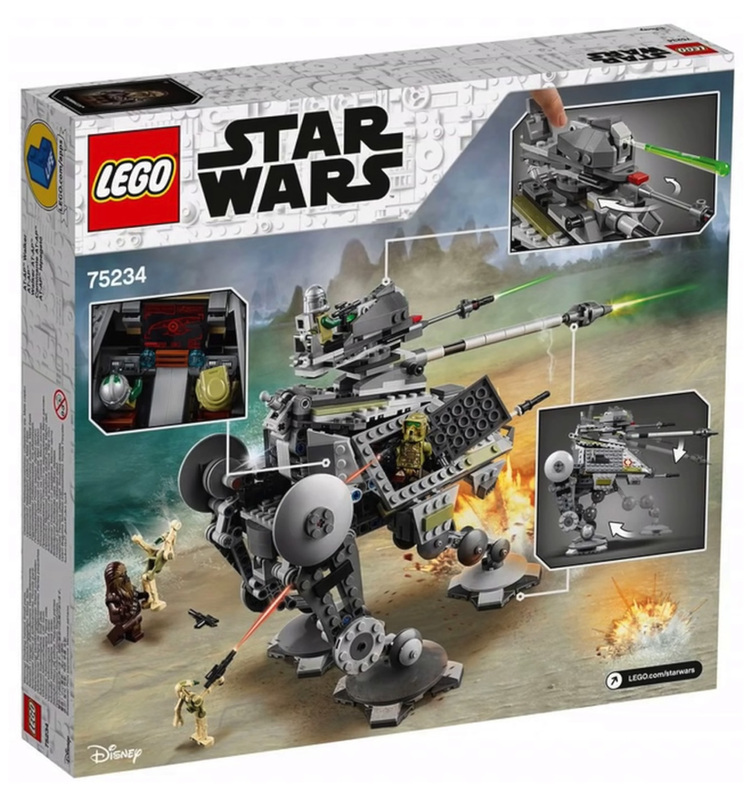 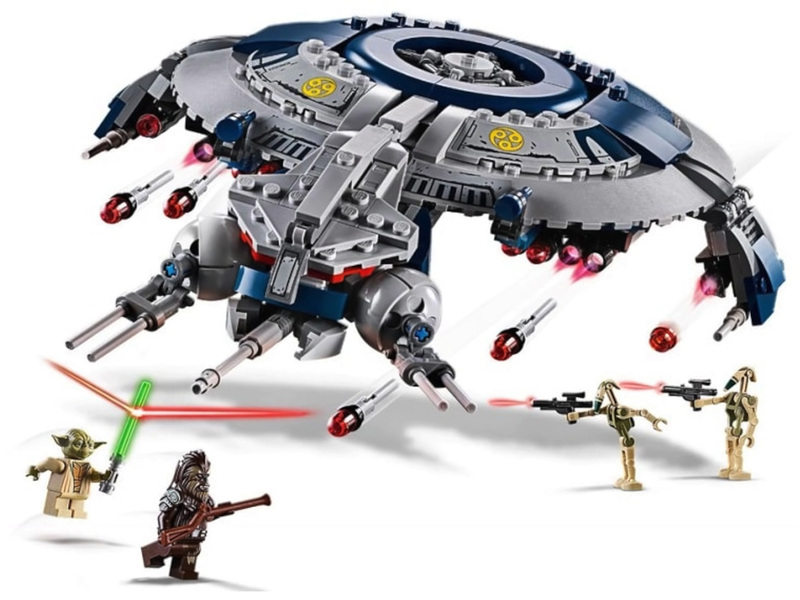 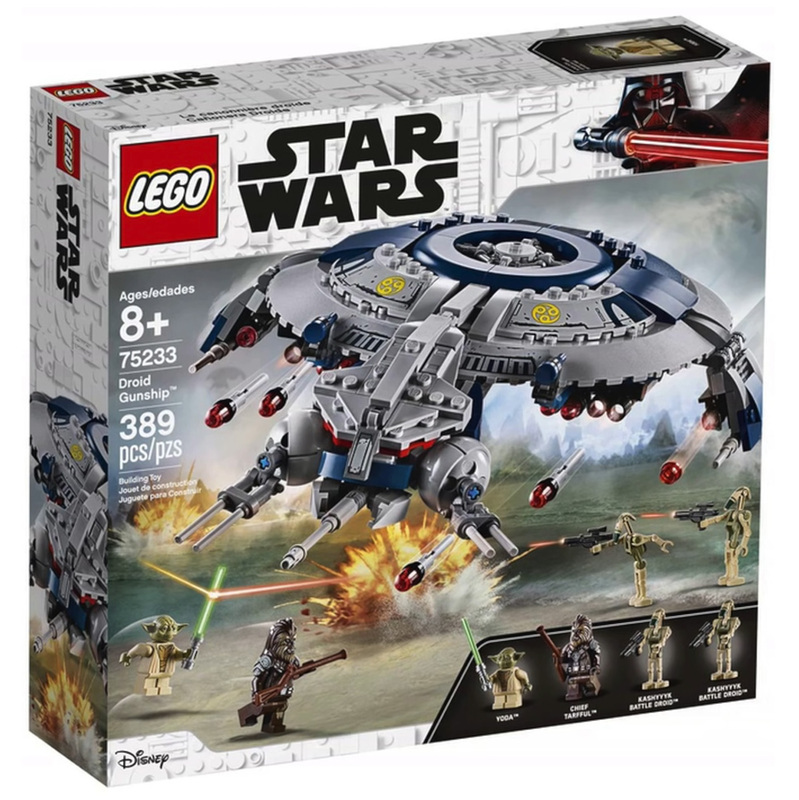 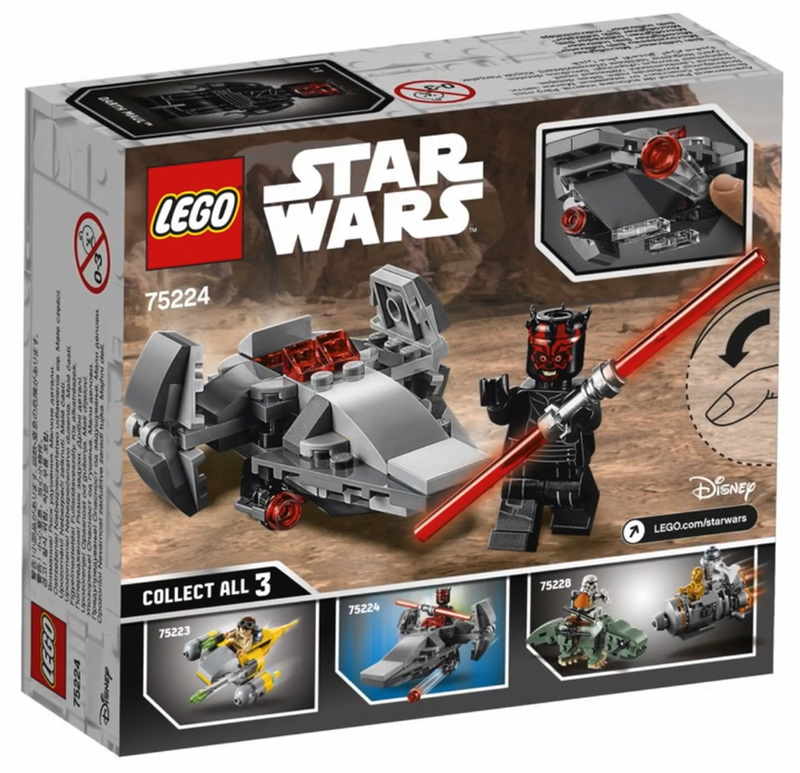 Droid Gunship (#75233) — includes Droid Gunship with eight dual flick missiles, two wing-mounted stud shooters and four minifigures of Chief Tarfful, Yoda & two new Kashyyyk decorated Battle Droids; 389 pieces for $49.99. 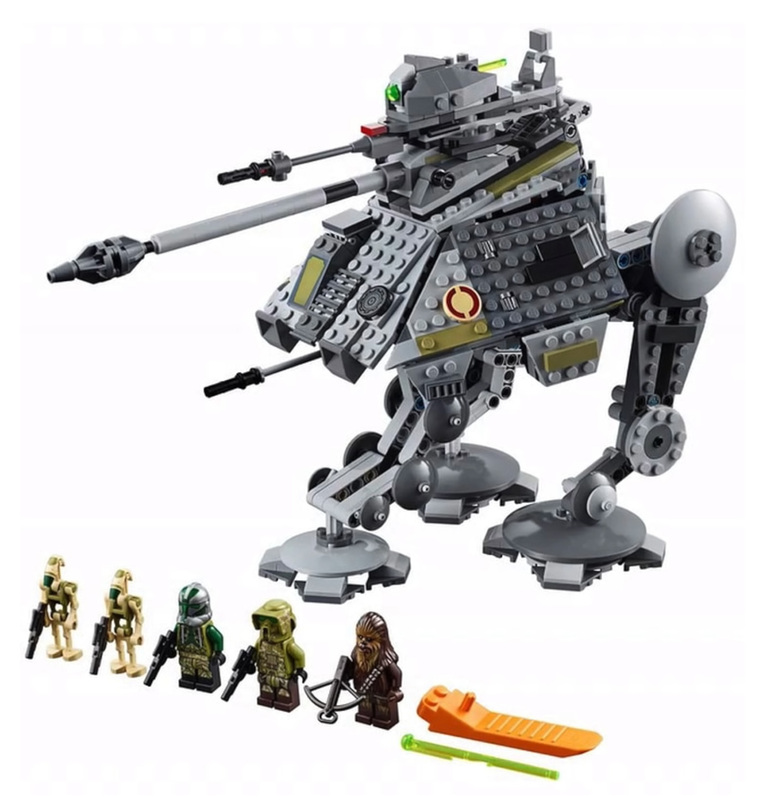 AT-AP Walker (#75234) — includes AT-AP walker with articulated legs/retractable third leg and five minifigures of Clone Commander Gree, Chewbacca, Kashyyyk Clone Trooper & two new Kashyyyk decorated Battle Droids; 689 pieces. 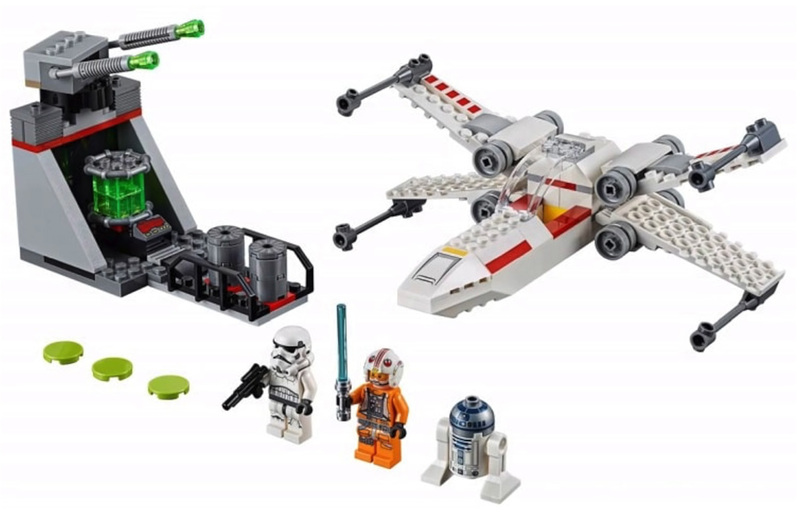 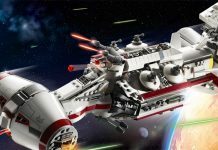 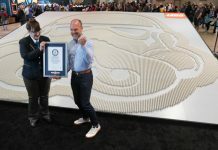 In addition to these new LEGO Star Wars sets, there’s lots of other new sets available from various themes including Overwatch, Captain Marvel, The LEGO Movie 2, CITY, Friends, Architecture, Technic and more — check out the links below — happy building! 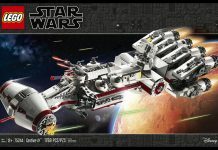 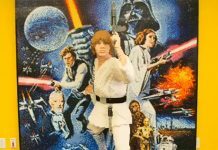 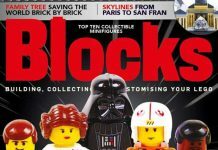 Please support Jedi News by purchasing your LEGO here for the UK, USA and Canada.